Ever wanted to know what happens in a quiet almost perfect little town at a fist glance and then you should check new Warner Bros. Home Entertainment release The Casual Vacancy. The HBO three-part mini-series are based on the bestselling novel by J.K. Rowling and will be available on Blu-ray, DVD and Digital HD on August 4! The Casual Vacancy is produced by Brontë Film and Television, written by Sarah Phelps (Eastenders, Great Expectations) and directed by Jonny Campbell (Doctor Who, Shameless). The mini-series centers on Pagford, a seemingly idyllic English village with a cobbled market square and ancient abbey. Behind the pretty façade, however, is a town at war. The rich at war with the poor, children at war with their parents, wives at war with their husbands, teachers at war with their pupils. 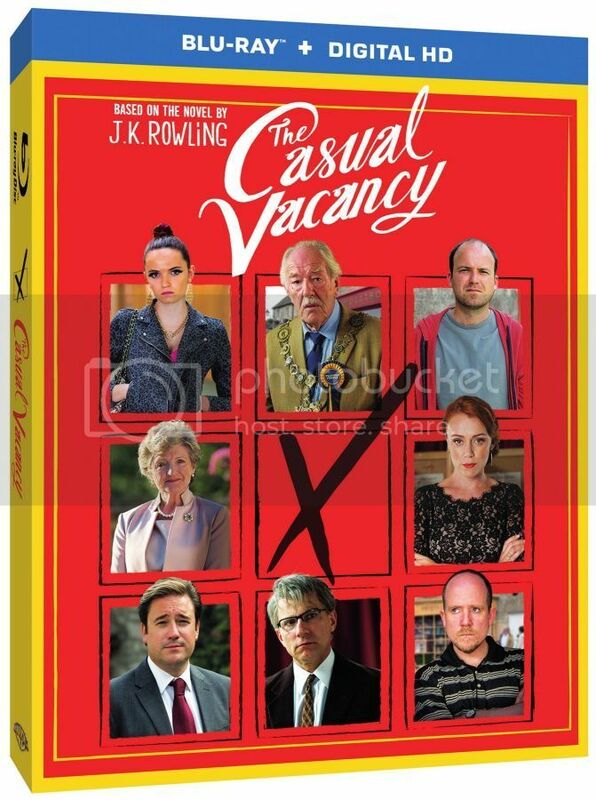 Don’t miss your chance to own this gripping new drama as The Casual Vacancy comes to Blu-ray and DVD on August 4, 2015. The plot of the story is pretty intriguing and keeps you involved from the beginning to the end. For our readers we are happy to host a giveaway, two lucky winners will receive a copy of The Casual Vacancy for themselves. The giveaway is open to US residents only (no P.O.Boxes please) and ends August 17, 2015. I love J.K. Rowling's book's and want to read this one too. I think this would be a movie I would enjoy. I can't wait to watch it. My girlfriend enjoyed the book so it would be cool to watch together. It would be an all new experience for me since I have yet to read the book. I love British miniseries and J.K.Rowling! I like JK Rowling and looks like a must see. i missed seeing it and would like to. I've had the novel on my TBR shelf for ages, and just haven't gotten to it yet. Thanks for the reminder - I'm gonna crack it open today, and then I"ll be crazy anxious to see the adaptation! I would watch it with my daughter looks like a good movie!